The 1977 double album has been released on CD previously, yet the present digitally remastered version comes with the added bonus of a DVD featuring an almost 60-minute-long Czech Television programme capturing thirteen of the most captivating songs. 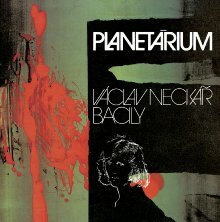 Václav Neckář’s band Bacily, a veritable Czech artrock phenomenon, had at the time perhaps the strongest line-up in their history. The music on the CDs was mainly composed by Ota Petřina, the bandmaster Jan Neckář and Josef Kůstka, with several songs penned by Petr Janda and Jaromír Klempíř. Rytíř’s lyrics are supplemented by texts written by Michael Prostějovský, Ladislav Kantor and Zdeněk Borovec. Although not all the compositions are from a single musical mould, Neckář’s unique vocals make them exceptionally cohesive. When it comes to the scope, style and success attained, this was undoubtedly a unique project. A band made up of true rockers, as well as the arrangements for string orchestra, and the guests C & K Vocal contributed to the creation of music with Entry and Exit and, above all, Rhyme and Reason. Diamantová žena (The Diamond Woman), Co je to svět (What the World Is), Potulný hráč (The Wandering Player) and Hvězdné nebe nad Atlantidou (The Starry Sky above Atlantis) are probably the best-known songs, yet integrated into the whole in very elaborate connections. The 2 CDs and the television recording bring back memories of a landmark Czech rock project, not only in 1970s terms. The legendary Planetárium, for the first time ever in its entirety! The double LP Planetárium was released in 1977 in a beautiful fold out cover and rerecorded with English lyrics in 1981. It was probably the most ambitious project in Václav Neckář’s whole career: a recommended varied and imaginative prog rock album. The CD set is completed by a DVD from the Czechoslovakian TV program from 1983 showing a colourful phantasy collage of Václav Neckář and the band using animated cartoon, paintings like the Mona Lisa and a lot of quite unusal ideas backing the music.